In 2007, the MkIV Brewer #066, belonging to Sapienza – University of Rome, was moved from the Joint Research Center in Ispra, where it had been successfully operated since the 1990's, to the headquarters of the Environmental Protection Agency (ARPA) of the Aosta Valley (Saint-Christophe, 45.74N, 7.36E, 570 m a.s.l. ), Italy. The new site is less than 100 km westward from Ispra. 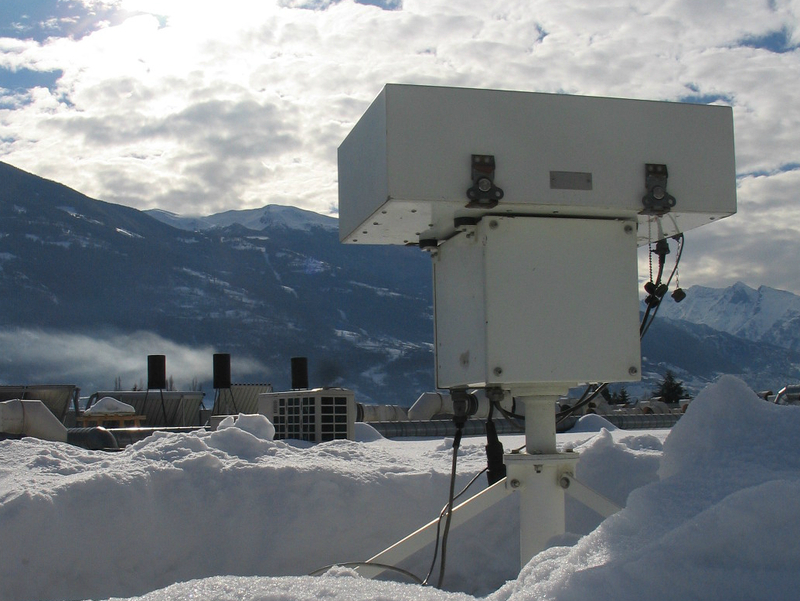 The instrument is installed on the roof of the building of the agency in charge (Fig.1 below) in a semi-rural context and in a large valley floor, surrounded by the Alps, with a wide field of view. Fig. 1: Brewer #066 on the roof of the agency in wintertime. Brewer #066 is now part of a well-equipped and integrated solar observatory (Fig. 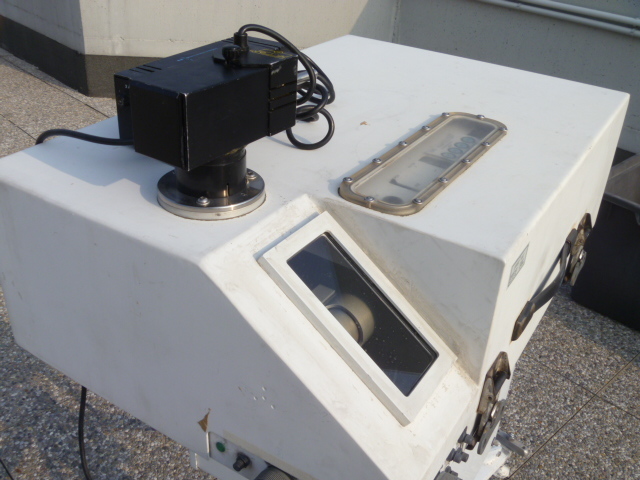 2) consisting in three UV radiometers, a double-monochromator spectroradiometer, a pyranometer, a pyrgeometer, a sun photometer and a lidar-ceilometer. The Brewer not only provides useful ancillary data to understand the levels of the solar irradiance measured at ground, but it also actively contributes to both the world (WOUDC) and European (EUBREWNET) ozone networks. Being a MkIV, it measures the nitrogen dioxide column concentration and the aerosol optical depth (AOD) in the visible band; besides ozone, sulphur dioxide and AOD in the UV band. Fig. 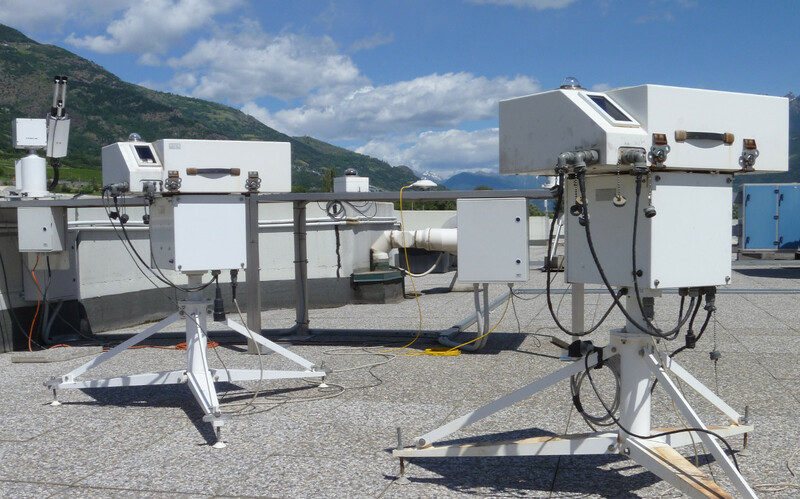 2: The solar observatory of the Environmental Agency of the Aosta Valley (the picture was taken during a Brewer comparison). The aim of our work was to show that MkIV Brewer spectrophotometers, if properly characterised and maintained, are able to reliably measure nitrogen dioxide. Indeed, more than 80 MkIV Brewers have been put in operation worldwide and long-term records, sometimes more than 20 years long, have been collected at the respective stations. If correctly reprocessed, these NO2 measurements would represent an invaluable set of data that would allow a deeper understanding of the atmospheric changes in the last decades. For this purpose, the original algorithm to retrieve the NO2 vertical column, developed in the 1980’s and still used in the operating software, had to be updated, otherwise overestimations larger than 100% would be observed. This is partly due to the obsolete cross sections used in the algorithm itself, updated to more recent spectroscopic databases during our work, and partly to the fact that no on-site service with reference travelling standards (as available for ozone calibrations) exists to track the NO2 radiometric calibration of the instruments. Finally, special attention was paid to avoid interferences (e.g., by O4, water vapour, the Ring effect for zenith sky measurements and instrumental factors, such as slight wavelength misalignments) and new weighting factors were calculated for better performances (using all 6 slits). Fig. 3: Dispersion test. The standard DSP routine had to be updated to allow measurements of the emission lines in the visible from Cd, Zn and Hg lamps. 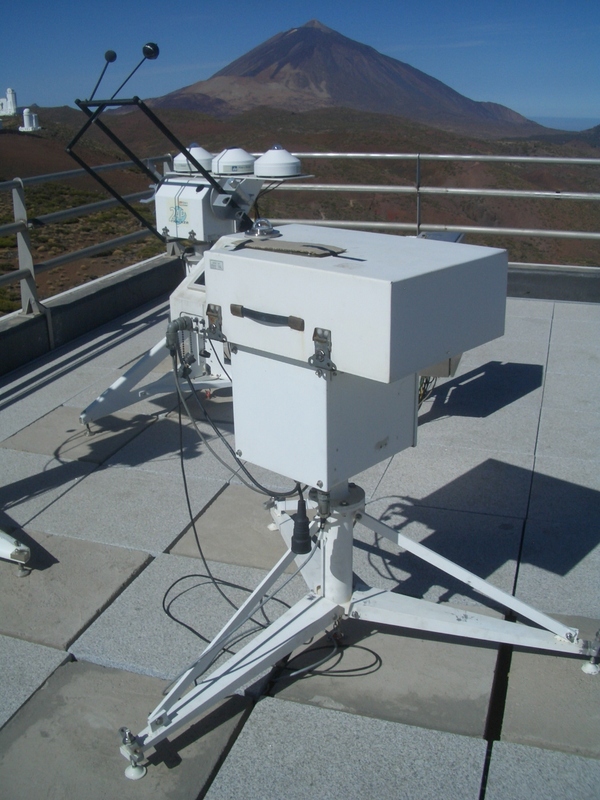 Then, the instrument was moved to the Izaña atmospheric observatory (Fig. 4) for a two-month campaign, to Langley-calibrate the instrument, test the algorithm and compare the results to reference instrumentation (a Fourier transform infrared radiometer and an advanced visible spectrograph based on the DOAS technique). The measurements schedule included direct sun and zenith sky measurements (the ZS air mass factors had to be recalculated with the help of a full-spherical model). Both parallel and perpendicular polarisations with reference to the principal plane of observation were used for zenith sky measurements (the tracker was rotated by 0° and 90° to the sun) and the results among different observation geometries were compared. As “spin-off” products, the degree of linear polarisation of the sky and the O4 column densities were simply retrieved by the algorithm. Some difficulty was met for the Langley calibration, since NO2 is not stable during the day, even in a very pristine site, due to the stratospheric photochemistry. The daily variation was then included, as an additional degree of freedom (to be more precise, as a linear increase), in a “generalised Langley calibration” developed specifically. Fig. 4: Brewer #066 at the Izaña observatory during the calibration campaign in 2012. The Teide volcano is visible in the background. Comparisons of the Brewer measurements to two co-located reference Network for the Detection of Atmospheric Composition Change (NDACC) radiometers showed good correlations (R² up to 0.95) and low mean biases in the column amounts (from -0.012 DU to 0.013 DU, depending on the Brewer observation geometry). Consistency among different Brewer observation geometries was demonstrated through comparison of the retrievals. Furthermore, a complete analysis of the uncertainty was performed by means of a Montecarlo method, with results ranging from less than 0.1 to more than 0.2 DU, depending on the observation geometry and the NO2 amount. Once the instrument came back “home”, in Saint-Christophe, the series recorded at this site since 2007 was post-processed with the new algorithm. The radiometric stability was checked using both the standard lamp measurements and some statistical tests (“minimum-amount Langley extrapolation” and “bootstrap estimation”). The NO2 retrievals were correlated with in-situ concentration measurements (Fig. 5) and satellite retrievals. Fig. 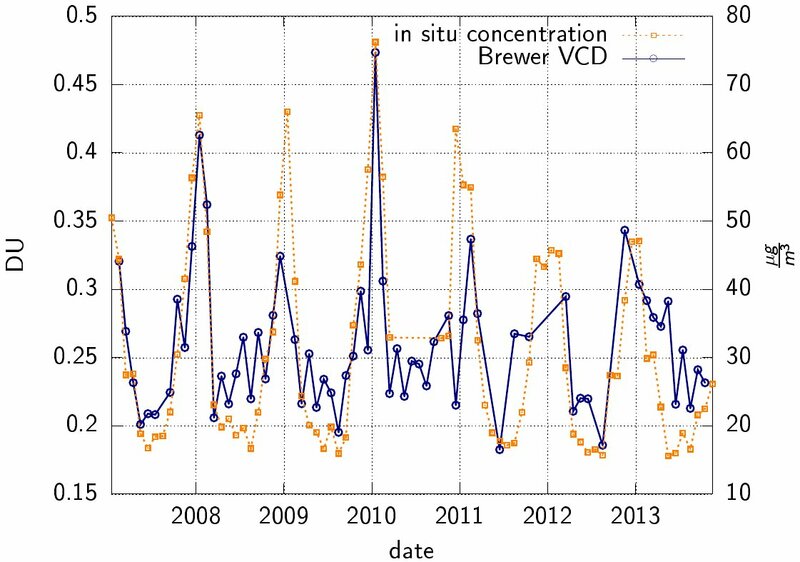 5: Monthly means of the NO2 vertical columns measured by the Brewer (blue points and left axis) and monthly means of in-situ concentrations (orange points and right axis). The agreement between the column density from the Brewer and the in-situ concentrations is remarkable: winter maxima and summer minima, as well as year-to-year variations, correspond in both the datasets, with a Pearson’s correlation coefficient of 0.75. This is clear evidence of the relative importance of NO2 pollution in the lowest layers of the atmosphere (measured by both techniques), even in a semi-rural site such as Aosta. Several factors contribute to the observed seasonal cycle: higher emissions in winter, temperature inversions, increased photolysis during summer and increased lifetime of NO2 during the winter months. 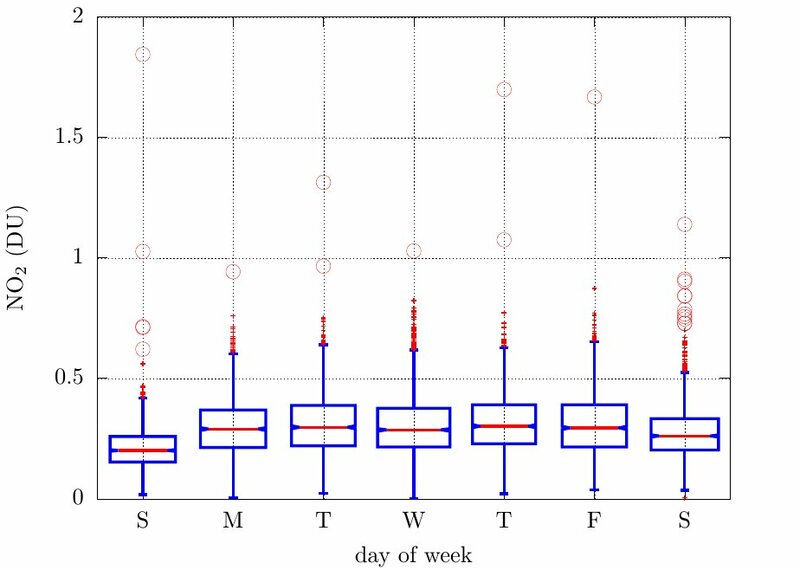 The anthropogenic influence is clearly revealed when the NO2 Brewer measurements are plotted as a function of the day of the week (Fig. 6). Fig. 6: Weekly cycle of nitrogen dioxide measured by the Brewer in Saint-Christophe. The horizontal axis represents the day of the week, from Sunday to Saturday. On the other hand, the comparison with three satellite radiometers (OMI, SCIAMACHY and GOME-2) provides very low correlations (lower than 0.1) even though the mean biases are insignificant. This points out the inability of current satellites to adequately probe the lowest layers of the atmosphere in areas with complex orography and likely covered with snow during part of the year. Therefore, accurate ground-based measurements, such as those provided by Brewer spectrophotometry, are still of great importance as reference data for satellite validation. Further analyses are planned at different European and world stations where long-term NO2 datasets have been recorded. Then, possible changes to the algorithm and to the software may be proposed to the Brewer users community. Originally Installed in 1991 at JRC. Moved to ARPA Valle d'Aosta in 2007. Currently operated by ARPA Valle d'Aosta (Environmental Protection Agency of Aosta Valley). You can update information about your Brewer or add pictures by e-mailing the editors of the website.